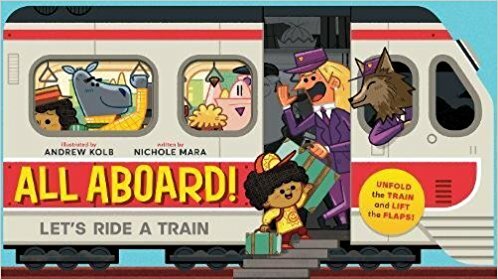 Last year, I reviewed the super fun All Aboard!, the accordion style, lift-the-flap board book that you can get down on the floor and play with. Like All Aboard!, All Aboard! the Christmas Train unfolds to nearly four feet of book. One side of the page makes a continuous illustration showing the tracks that the train travels on while the other side, flaps show the numbered outside of each train car, lifting to reveal the inside of the train and the travelers. 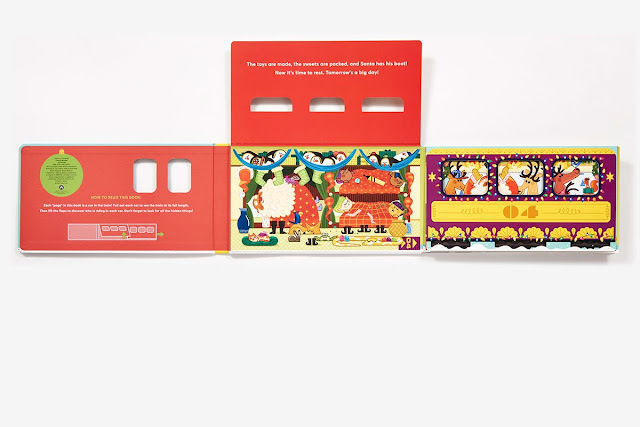 Each lifted flap has text that invites readers to search the five train cars for special things, count things, find items that start with the letter B, find things that zoom and more. 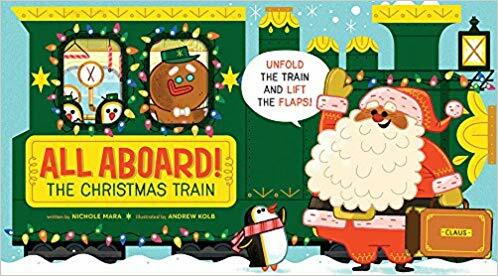 And, Santa (who, wonderfully, is the same color as the gingerbread man driving the train) has lost his boot somewhere in the five cars. Guaranteed fun for everyone!